Teampappan has made new friends, part I. Small boats, maximum length 10 feet and a simple box rule make it easy and inexpensive to experiment. Since the start 20 years ago the enthusiastic innovative Italian 10 ft sailors have increased their top boat performance by 212 %! 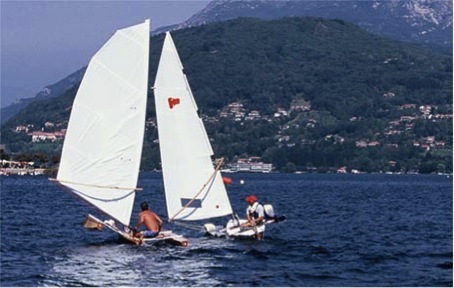 In 1991 Paolo Lodigiani, a small boat enthusiasts, took the initiative to found Classe Diecipidi, The 10 ft Class. 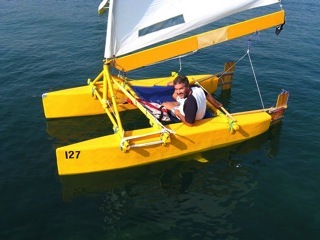 Paolo runs a boat kit company and wanted to promote the development, amateur building and racing with small boats. 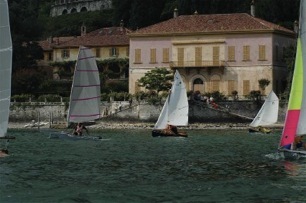 The first race was held outside Villa Pizzo in Cernobbio by beautiful Lago di Como in northern Italy. The Classe Diecipiedi box rule was inspired by the american 3 Meter Tri and a French 10 feet box rule the latter doesn’t seem to be around any longer. The rest is free, generating a fantastic range of designs. For lots of examples check here. 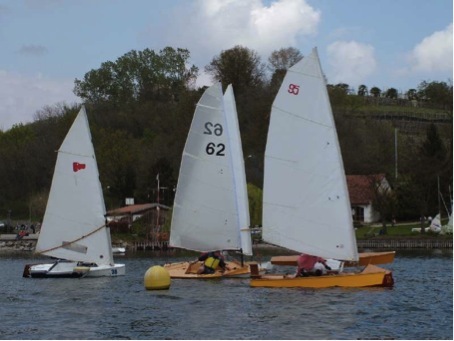 Fulvio Cocchi and his ”Slim”, left boat, holds the present speed record for these 10 ft boats – 9.6 knots! 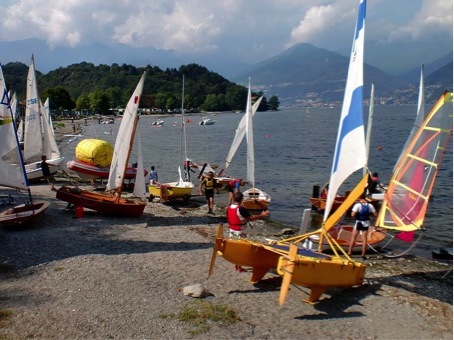 Most of the races are held on the lovely lakes of northern Italy. The Classe Diecipiedi has around 100 active sailors owning altogether some 150 boats. 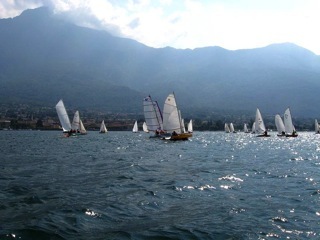 The important races attracts 20-25 sailors. Jacopo Faggioni won the 2011 Classse Diecipiedi Championship, scoring best overall in the 7 championship regattas. Jacopo has a long history with the class. He won the first race already back in 1991. At that inaguration regatta he met Laura, also a keen racer and they later got married. Laura is also still very active in the class. One contribution could be a Swedish 10 ft Class – ”sailing anyone”? This entry was posted in Reportage and tagged Classe Diecipiedi, italien. Bookmark the permalink.